The lands in question stretch from the east riverbank to just east of Circle Drive. There are a total of 15 parcels including the main campus and Innovation Place. This model is not new to the University as they already employed it at Preston Crossing and the new College Quarter. One slight hitch: the City of Saskatoon controls the inventory of available municipal land, as is the case in other major urban centres. The land the U of S is bringing on would be direct competition to the City’s inventory. A partnership between the City and the University will be vital to seeing this development take shape. The challenge is that both parties will have to agree on the vision. Each side has unique and significantly vested interests. It allows the University to collect revenue while still retaining the real estate. Though it’s not stated in their intentions, they could sell it as improved at any time. Developing and selling land generates revenue for the City of which they admittedly will want to protect. Bringing on this land for medium density housing could make their land inventory less desirable. Yet each side needs the other; the University will require the City’s blessing regarding items like zoning and servicing to move forward. The two parties will need to tread carefully as each looks to achieve their agenda. 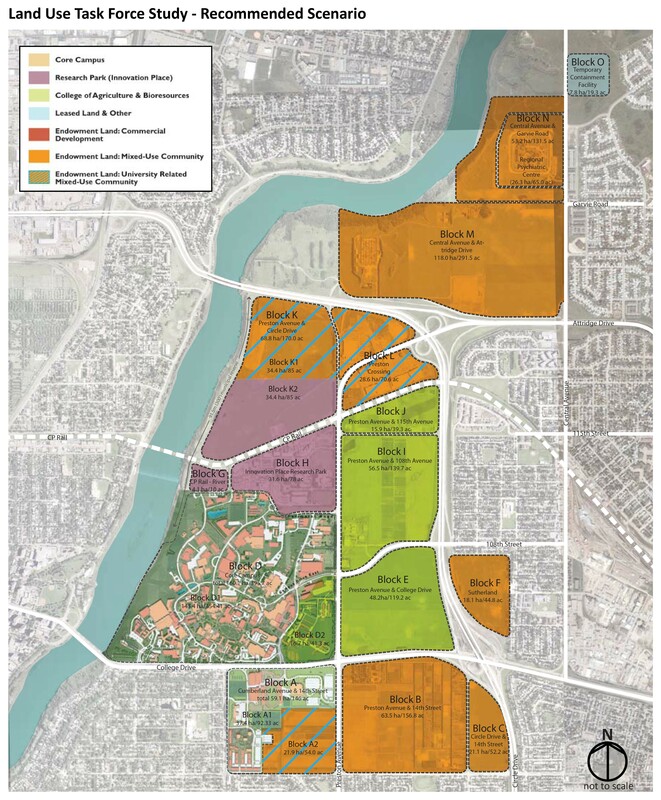 The University has explained that they seek a vision for the development that brings “higher design standards to its development than exist in the average new Saskatoon neighbourhood.” The City can’t help but feel slightly stung by the comment. The land was initially purchased when it was on the outskirts of the City. With a proximity of 5km to the downtown, this type of “gift” to themselves has tremendous potential. In the 2009 report entitled Vision 2057, the University lays out a financial analysis. The lands are assessed parcel by parcel on 50 year plans. They’ve estimated different densities against a mix of residential and commercial users. Their working scenario assumes the following: a phased in build out 780 acres over 70 years with primarily residential use, reserving approximately five per cent for commercial. This excludes the main campus, Innovation Place and Preston Crossing. Under this scenario, the leases are prepaid on 99 year terms during the span of 2042 to 2048. Renewals are based on 30 year terms. By their definition, the endowment is created by the revenue from the land leases. The capitalization rate on this scenario is seven per cent per annum. Using their medium density forecast, which is most likely, the land would comprise of mixed residential uses including single-family, townhomes, and apartments. This would result in $339 million for the endowment by 2048. When coupled with the sum of annuities for annual University at $233 million, this totals a value of $572 million. Surely the City is concerned with settling 120,000-180,000 people where they were none. Issues like traffic congestion and transit must be addressed. Likewise, residents in the immediate proximity to the area are unlikely to be excited about the import of the additional neighbours. City councilors are asking for as much consultation with the public as possible. Additionally the University has to contend with the Meewasin Valley Authority as they have jurisdiction of development near the river. They can nix any proposal they view as dangerous to the river valley. There are very few residential developers who will be interested in land lease development. Preston Crossing has obviously succeeded as a retail development, however, multi-family will present different challenges. Success in attracting developers will depend on the overall vision and controls the University sets on the land use in their plan. It is clear that this will take extensive planning and time to come to a conclusive plan that will please all parties involved. How quickly that can be achieved is anyone’s guess.